MITCHELL _ Brent (Bert) James 1954 - 2005 Brent Mitchell of Langdon, Alberta, beloved husband of Barb and dear father of Bradley (twelve) and Brock (nine), passed away after a lengthy illness on Monday, December 19, 2005, surrounded by his loving family. Brent also leaves to cherish his memory his mother Alice; sisters, lso leaves to cherish his memory his mother Alice; sisters, Maureen, Kathleen (George); niece Livia; and brother Blair (Theresa). Brent was predeceased by his father Cliff in 1992. A Memorial Service will be held Friday, December 23, 2005, at the Langdon Baptist Church, Langdon, Alberta at 11:00 a.m. If friends so desire, memorial tributes may be made in BrentHOME LTD. (Strathmore) in care of arrangements. Telephone: 934-5666. Published in the Calgary Herald on 12/21/2005. Hello Hudson from the 50's. Just found this place. I can remember and have been back to Ben's, Mullens and HYC. Hockey behind Ben's, hello Dave Crocket, Gavin Weylie, the Ritchie's, Chalmers, Clint Ward, Simon's farm et all. Been living in Hamilton for the past 30 yrs. Usually drive through town when I go to Montreal. Lots of good memories. Lets stay in touch ! Present and former residents of this area may be interested in helping with the on-line transcription of the 1911 census for this area. If you have some spare time and an interest in the social history of the area, consider volunteering for this project; more information is available at the following site: http://automatedgenealogy.com. Also someone with good knowledge of the area families might wish to proofread the 1901 pages. 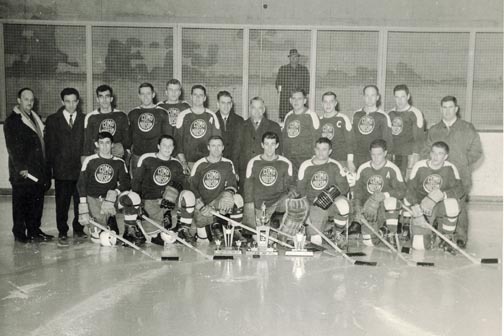 Believed to have been taken some time back in the 60s, the photo above shows the Hudson Como hockey team with their trophies. Back row (l. to r.): Fern Lauzon, Rene Chevrier, Yvan Chevrier, Gerry Major, Peter McArthur, John Boudreau, unknown, Albert Danis, Harold Benson, Bert Pilon, Steve Davis, Edgar Leger and David Crockart. Front row: Ron Metcalfe, Dave Hogan, Johnny Denis, Ron Rozon, Gerry Menard, Jacques Leger and Bill D'Aoust.